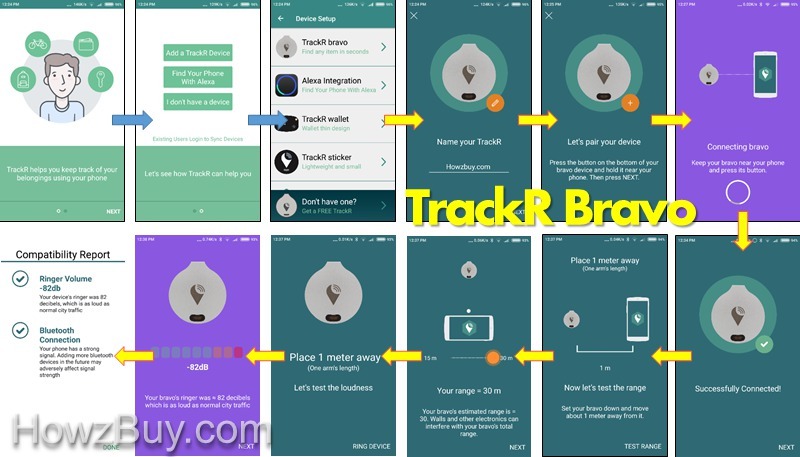 As I wrote on comparison of famous key & wallet trackers like TrackR Bravo, Tile, Chipolo & Cube, I also got evaluation copies of TrackR Bravo & Chipolo, here is review of TrackR Bravo as tested on two units so far. I can’t comment which is the cheapest wallet tracking device, since all these trackers are on sale for around $25, so you can select them based on the basic lost item finding function and its crowd GPS support. Looking at the photograph above, you will get an idea that TrackR bravo is a coin sized bluetooth wallet tracking device, its very small circular coin shape, made from colorful anodized aluminum housing having a small loop at the top which makes it easy to attach to a keyring, gets easily inside the pet collars, fits in a purse, wallet, or camera bag. This lost item tracker also comes with adhesive pad which allows it to be pasted to anything like your bicycle, camera, laptop etc. When I tasted the adhesive tape supplied with the TrackR Barvo, it worked quite well, the adhesive strength is pretty good and does not come out easily, I applied lot of force to detach it again from my DSLR camera. New Launch: TrackR Pixel !! TrackR Pixel Launched by the company in June 2017. Glows-up in the dark. Loud Ringer w.r.t. previous versions. Please note that you need to have Android 4.4 + OR iOS 8 + OS versions on your Android OR iPhone to use the TrackR Bravo App. During my resent trip to Zurich, I was hopping in multiple flights, hence I decided to attach one BT tracker unit to my Checkin baggage using the key ring (provided free with the unit) and another BT tracker to my DSLR camera using adhesive circular pad. Both were tested for a week during my trip, during flight travel, during on-road travel, in crowd, in hotel room and so on … Both the trackR Bravo range as well as alarm sound was tested thoroughly by me. After installation of App, I tried pairing trackers with my phone, (one unit to iPhone and the other with my Android) – See the image showing sequence of actions. First the TrackR asked to switch on the Bluetooth, later it asked GPS permissions. After coming back with my Android phone in front of TrackR Bravo, it kept on searching for the connection and took long long time to reconnect ! It took almost 4 minutes to get reconnected to the device ! While I tested the range during my flight travel, TrackR Bravo could not locate the luggage kept in check-in baggage !! However at the same time Chipolo kept in the same baggae could locate the luggage in 5-10 seconds !! So for sure TrackR Bravo bluetooth range as well as reconnecting capability is very poor !!! I am highly dissatisfied with the performance of TrackR Bravo in this case. The location indicator on the map with last seen is good to help you direct towards the tracker, tested and worked well. When tested for bluetooth range directly in line of sight, it lost connection after 30 feets !! So as per me this is very poor range for the tracker, while finding the lost item this will make it difficult or almost impossible to locate the tracker for you as well as someone who is on the crowd gps tracking. The TrackR is fitted with CR1616 standard replaceable coin cell. The button cell should last for an year as per the company. Unlike Tile where you will never know that battery is died 🙁 TrackR Bravo scores high in this feature, its App is able to indicate the battery level inside the tracker device. I switched on the separation alerts in the App, however it didn’t work well with TrackR Bravo 🙁 at the same time Chipolo worked very well with separation alerts in seconds after travelling to another floor of my house. So during my testing the two way separation alerts miserably failed !! It did work on the tracker device, it ringed after separation time of about 3 minutes, however the phone does not ring at all !! Anyway separation alert after 2-3 minutes on the tracker is not at all okay since the ring is very weak and by that time I should have reached beyond limit to hear to the ring. The alert works randomly, sometimes it rings immediately when I am out of range, but it shows unreliability of this tracker to find lost items. Disclaimer : We got TrackR Bravo FREE of cost from the company, we are thankful to the company for the same. Maintaining authenticity of review is prime importance to HowzBuy.com, that is how the above rating & recommendation is done. Good Read : Comparison of TrackR Vs Tile Mate Vs Chipolo Classic Vs Cube make of BT key finders.